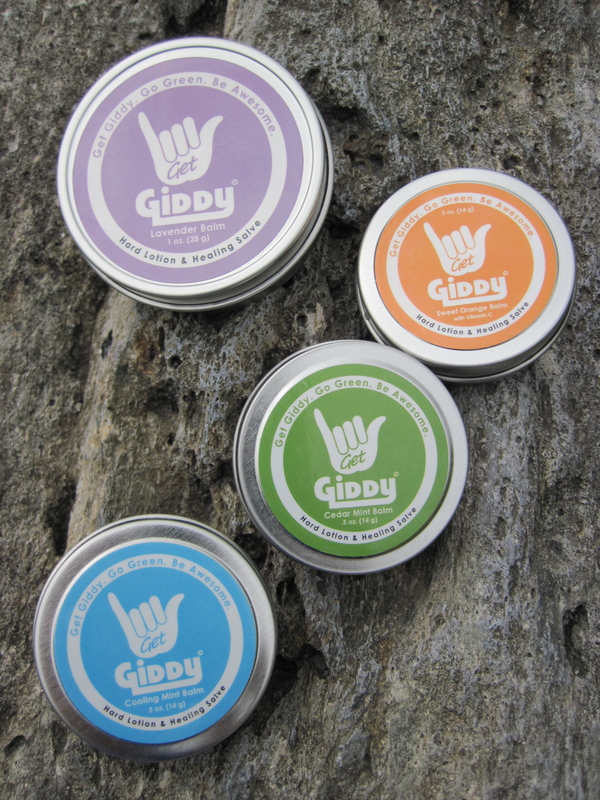 Giddy produces brilliant balms that manage to pull off the trick of moisturising hands while not weakening calluses. Giddy Hard Lotion, Balm and Salve. My son loves opening the mail. It’s probably because there is something intrinsically fun in ripping open envelopes and pulling apart parcels to discover what’s inside. Sometimes he discovers something fun, although mostly he finds a bill for me or yet another request to switch broadband provider. Recently he enjoyed opening a parcel from North Carolina to find shiny tins of balm from Giddy. Each time we opened up a tin my son would say “that’s lovely!” at the fresh and zinging smell of the balm. Giddy started in a college dorm room. Student Tyler Ward had tried most of the remedies for his acne given to him by dermatologists and found none really worked. This was when he developed his own effective treatment using natural ingredients. Word spread about his natural face scrub and it proved a hit on campus. Tyler’s means of learning a little spending money at college grew into Giddy and a range of skincare products (Tyler’s full telling of the origins of Giddy is on the Giddy blog). Giddy declares that its ingredients are made in America, are eco-friendly and mostly organic. Giddy provide a helpful explanation of what each ingredient is and why they use it on their website. Most balms for climbers have beeswax or cocoa as their primary ingredients, so it’s unusual that the main ingredients of Giddy balms are sunflower oil and carnauba wax. Carnauba wax comes from the leaves of a palm native to Brazil. It’s used in cosmetics because it’s hypoallergenic (i.e. causes fewer allergic reactions) and a moisturiser. It’s also insoluble in water and melts at a high temperature. This higher melting point is why carnauba wax is used to coat sweets to ensure that they don’t melt in your hand. It also means that Giddy balms melt less readily when you apply them. Giddy says that this makes their balms less greasy than balms mostly based on beeswax. There is still some beeswax in Giddy balms, as well as cocoa butter and several different types of oils. The beeswax acts as a humectant. It attracts moisture in the air, draws it into the skin and locks it in there to both treat dry skin and prevent skin drying out. Beeswax is also said to help wound healing by being anti-inflammatory, anti-bacterial and anti-allergenic as well as being a germicidal antioxidant. In addition, it’s a source of Vitamin A (so good for cell development) and is said to create a protective coating for your skin. The beeswax also binds together and emulsifies the oils in the balm. It’s a neat approach to solving the main issue climbers have with taking care of the skin on their hands. Abrasion, chalk and the elements dry out and damage your skin and so you want something to moisturise and repair them. However, you don’t want something that moisturises so much that the skin (particularly the calluses) get soft and so more prone to getting damaged. In assessing whether this approach actually works in practice, I’ve used the scoring system (out of 40) that I’ve used in my earlier reviews of climbing balms. Ingredients: organic sunflower oil, organic carnauba wax, organic cocoa butter, organic sesame oil, beeswax, refined (gluten-free) wheatgerm oil, organic sweet orange/peppermint/lavender/cedarwood essential oil (which of these essential oils is used depends on the type balm), organic calendula oil, non-GMO natural source Vitamin C, GMO-free Vitamin E oil. As I said, the first thing that struck me when I opened up the tins of Giddy balms were the really amazing smells. Most balms I’ve tried have smelt woody, herby, spicy or a mixture of these things. Giddy balms have a zing and freshness that makes them stand out. This smell is initially quite strong when you rub the balm over your hands, but it fades to a much more subtle smell in about ten minutes. The four different types of smell (cedar mint, cooling mint, lavender and sweet orange) are achieved by using different essential oils. Each smells exactly like you imagine it should (i.e. not artificial). I also really like that this range of smells (for what is otherwise the same balm) means that most people should find at least one type of balm that they like the smell of. Giddy say that this balm is a “multi-purpose product can be used to treat flappers, blown tips, scrapes, cuts, abrasions, soothe burns, rashes, raw skin, cracked skin, cracked cuticles, road rash, abrasions, dry skin, poison ivy and any skin issue that needs moisturized and nourished.” I haven’t tried it out for all those uses (thankfully I haven’t had road rash or touched poison ivy since I started using these balms), but I have found Giddy balms really effective after climbing and as something to use to keep my hands in a good condition day-to-day. The skin on my hands had been going through a bad patch before I started using Giddy balms. I had peeling skin around my fingertips and areas of skin that looked like a dried-out lake. My hands have been a lot better since using Giddy balms. The moisturizing effect is excellent, with my hands staying nice and moisturized through the day. Plus, Giddy seems to have pulled off the clever trick of creating a balm that moisturizes while allowing calluses to stay to protect the hands. They have also succeeded in making a balm that is less greasy or oily than some balms based on beeswax or cocoa butter. Unfortunately, Giddy balm recipe has traded oiliness for waxiness. For about 10 to 15 minutes after putting the balm on my hands have a slight shine and feel like they have a light coating of wax on them. It’s a slightly odd sensation, but it does fade away and that other balms can leave your hands oily for the same sort of time or for longer. The use of carnauba wax instead of beeswax makes the Giddy balms harder than other climbing balms. A beeswax-based balm will melt at body temperature and this makes it easier to apply. The Giddy balm doesn’t melt in the hand in the same way and so you need to put more effort into rubbing it over your hands when applying it. This isn’t a big issue and some people may even prefer a harder balm. 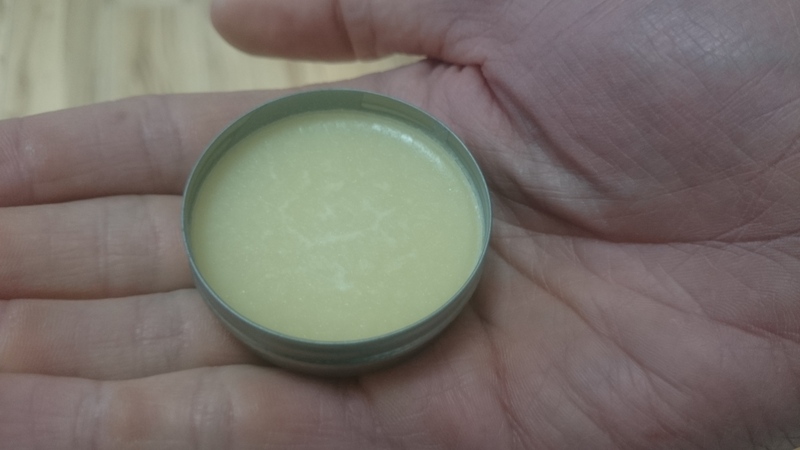 I can also see the Giddy balm being more practical in hot weather when a beeswax balm could go too soft. The Giddy hand balm in comes in 0.5oz/14g and 1oz/28g sizes. The 14g size is just the right size to be both useful and to drop into a pocket for when you need it. Ingredients: organic almond oil, beeswax, organic calendula oil, organic soy lecithin, organic menthe arvensis, organic peppermint essential oil, organic hemp oil, organic carrot seed oil, red raspberry seed oil, organic rosemary oil extract, GMO-free Vitamin E oil. This is a lovely lip balm. As soon as you put it on your lips you get a sharp hit of peppermint that lasts for about 10 minutes. It’s packed with ingredients to sooth and repair your lips. It smells really nice too. In addition to peppermint, it comes in spearmint, lavender and sweet orange varieties. Ingredients: Safflower oil, shea butter, carnauba wax, menthol, camphor oil, argan oil, glucosamine peppermint oil, beeswax, calendula oil, ginger oil, eucalyptus oil, MSM, rosemary oil extract, Vitamin E.
Giddy Joint and Tendon Balm. Macleod, Dave (2015) Make or Break, Roy Bridge: Rare Breed Productions, pp.24-25. However it works, the Giddy Joint and Tendon Balm does a pretty good job of relieving pain and tenderness. This balm readily melts under the fingertips, making it easy to get it out of the small tin it comes in as well as easy and quick to apply. The Giddy Joint and Tendon Balm has a sharp smell of menthol with a hint of citrus or ginger. My main criticism of it is that the absorption is poor. The balm stays on the skin like a slightly waxy layer. Some other balms can leave your skin oily o waxy for a while if you just use too much of them and it’s possible this is what’s been happening with the Giddy Joint and Tendon Balm. I’m going to see if I can find a balance between putting on enough to be effective and not overdoing it. 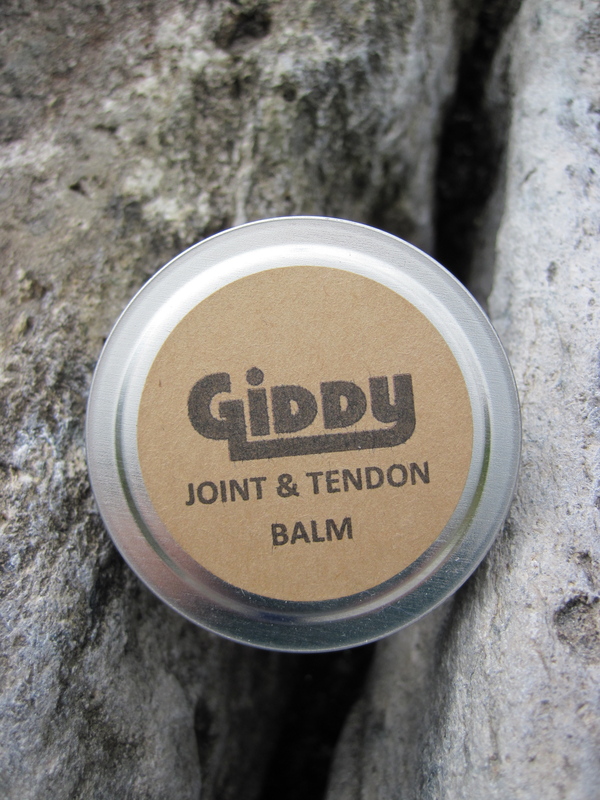 The Giddy Joint and Tendon Balm does a pretty descent job of relieving pain and tenderness and is easy to apply. However, it could do with being better at being absorbed. 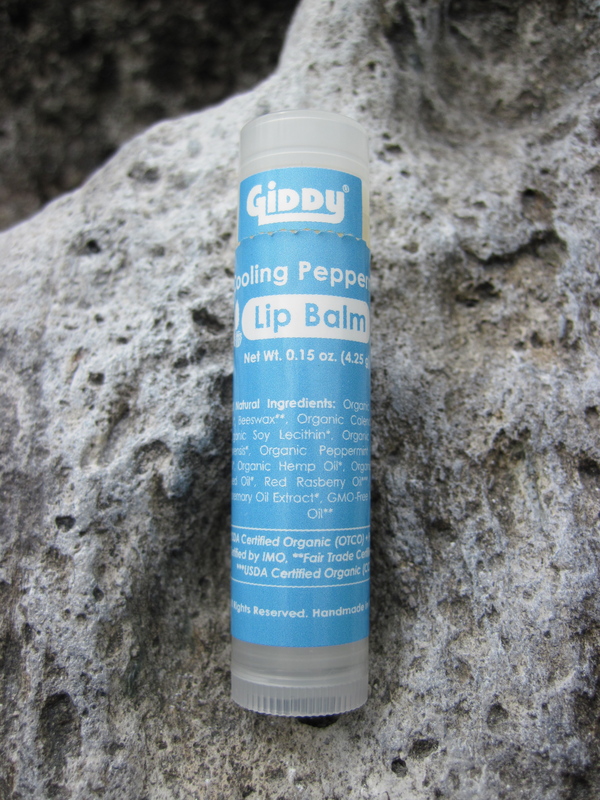 The Giddy Cooling Peppermint Lip Balm is a lovely lip balm that gives your lips a minty tingle. Giddy Hard Lotion, Balm and Salve is one of the best balms I’ve tried. It’s highly effective at looking after your hands and manages to do this without obviously weakening calluses. It’s harder than a lot of other balms and, although this makes it slightly harder to apply, that might be a feature you want from a balm. Plus, these balms come in a variety of great smells that will be sure to be liked by toddlers. Declaration: Giddy gave me free samples specifically for me to review. This hasn’t influenced my opinion. UPDATE: 8 June 2017 – The Giddy Joint and Tendon Balm that I reviewed here was the beta version and Giddy have brought out the final version since this review was written. Giddy kindly sent me some free samples of the finished product to try and I’ve reviewed it here. Great write-up as usual, glad to have the opportunity to get some products in front of you to give it a go. Just to add some clarity on the Joint and Tendon Balm, a lot of our climbing friends will apply this to their fingers and tips after a good climb. 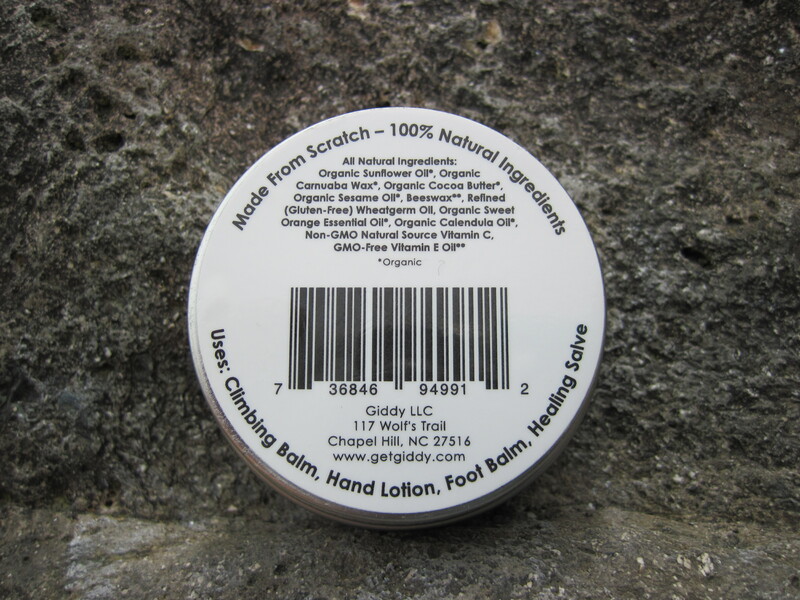 The balm contains several all natural oils, glucosamine and MSM. There are a fair amount of studies about Glucosamine and MSM and how they aid in Joint & Tendon repair. In short it was designed to sink deep into your skin and help heal and sooth your tendons and joints. When I personally use it, I like to apply some to my fingers and grab an accupressure ring. I massage my fingers with the ring which stimulates blood flow and feels great. The menthol and other ingredients give a nice soothing / tingling sensation during the massage! Fantastic! Look forward to more of your climbing reviews! Thanks Ben. I’m pleased that you like the review. I was happy to do it as they are such great products. Thanks also for the tips of the use of the Joint and Tendon Balm. Very interesting. I’ll give this a go on my next climbing trip.